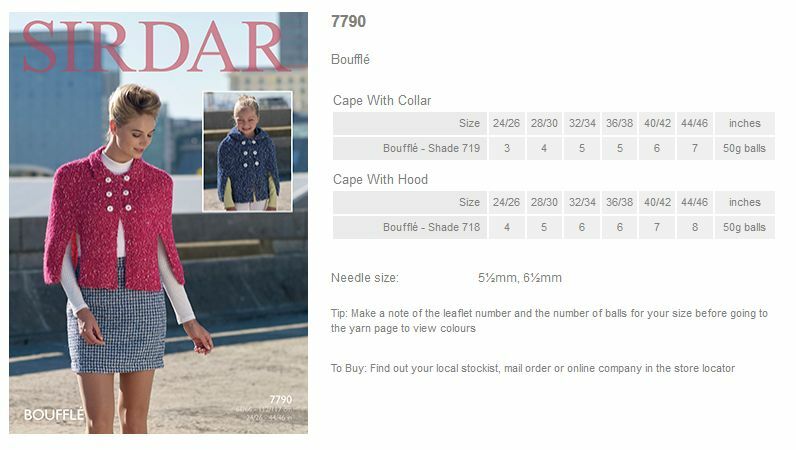 7790 - Cape with Collar and Cape with Hood using Bouffle Leaflet with designs for a Cape with Collar and Cape with Hood using Sirdar Bouffle. 7393 - Womens Sweater using Bouffle Leaflet with designs for a Womens Sweater using Sirdar Bouffle. 7391 - Womens Skirt and Top using Bouffle Leaflet with designs for a Womens Skirt and Top using Sirdar Bouffle. 7390 - Womens Jacket using Bouffle Leaflet with designs for a Womens Jacket using Sirdar Bouffle. 7389 - Womens Sweater using Bouffle Leaflet with designs for a Womens Sweater using Sirdar Bouffle. 7388 - Womens Hats and Scarves using Bouffle Leaflet with designs for Womens Hats and Scarves using Sirdar Bouffle. 7387 - Womens Shawl and Gloves using Bouffle Leaflet with designs for a Womens Shawl and Gloves using Sirdar Bouffle. 7386 - Womens Poncho using Bouffle Leaflet with designs for a Womens Poncho using Sirdar Bouffle.